Pondicherry is a small beach town along the coast of Tamil Nadu. The first thing that anyone will tell you about Pondicherry is to buy liquor since it is considered dirt cheap, thanks to its status as a union territory (UT). Just to understand what people thought about Pondicherry, I asked a few of my friends who had visited Pondy (as it is commonly called) in the past, but apart from the above point on liquor, a few mentioned about the Aurobindo Ashram, the Manakula Vinayakar temple, Auroville and nothing else. In the last 15 years or so, I’ve been to Pondy multiple times and know that this beautiful town offers this and more. 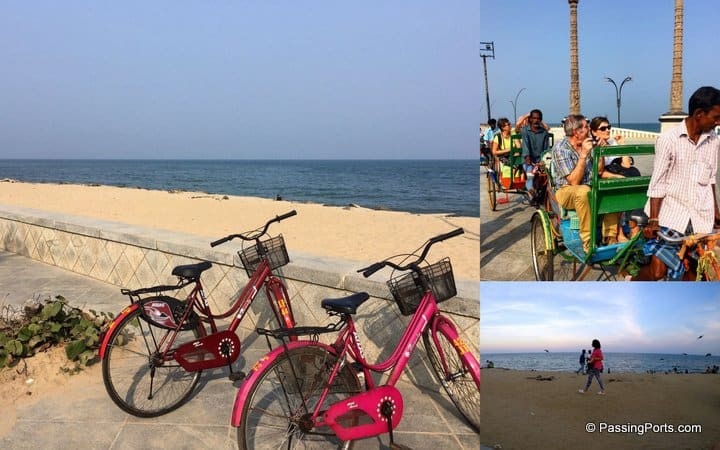 Here are a bunch of things you probably knew about Pondicherry, things to do and places to visit, but dive in to know about its evolution and existence. This post is not just meant for first-time visitors to Pondy, but for those who’ve been there before as well. 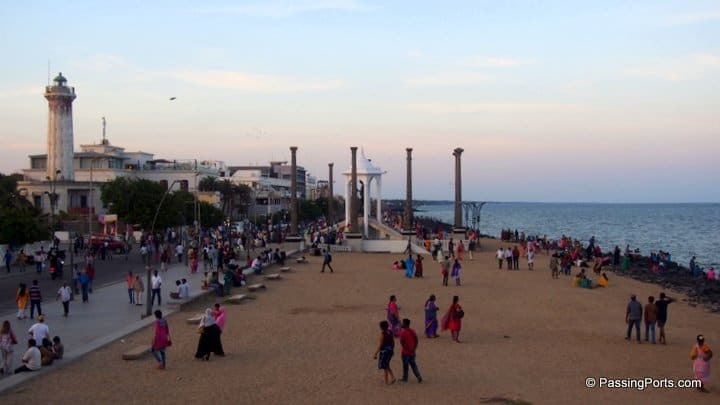 We all have either walked on or heard of the famous promenade in Pondicherry. The sight of the beach at sunrise, or the calm atmosphere during the day or during the golden hours of the evening is an experience one can cherish. While many enjoy the beach view, many miss the Old Lighthouse which is on the same stretch. The lighthouse, which was first lit in 1836, was functional till about the 1970s and was constructed by French Engineers. It was converted to a museum later but currently, it is not open to the general public. This is bang opposite to the Gandhi Mandapam. You can also catch a glimpse of it from the Le Cafe Restaurant, a cafe by the beach. Trivia: The building which houses the Le Cafe restaurant was once the port office. The above pic captures both the Old Lighthouse and the Gandhi Mandapam. This is the biggest statue of Mahatma Gandhi in Asia. What’s more interesting are the pillars around the statue. These were taken from Gingee fort and were erected here in the year 1866. Apparently, there was a tunnel underneath the statue that went all the way up to the Gingee Fort. Before you get excited about possibly exploring that tunnel, hang on. This was closed for good in the 1960s; but that leads me to the next place of interest in and around Pondicherry, Gingee Fort. The great Maratha ruler Shivaji said that this is the most impregnable fortress he has ever come across. The Britishers called it the “Troy of the East”. Sounds interesting, doesn’t it? Under the control of the Archaeological Survey of India, this fort is well maintained and is about 75 km away from Pondicherry. This fort was reportedly built (a part of it) by the Cholas. Then, it was under the control of the Nayaks, the Marathas, Bijapur Sultans, the Moghuls, Carnatic Nawabs, French and the British. 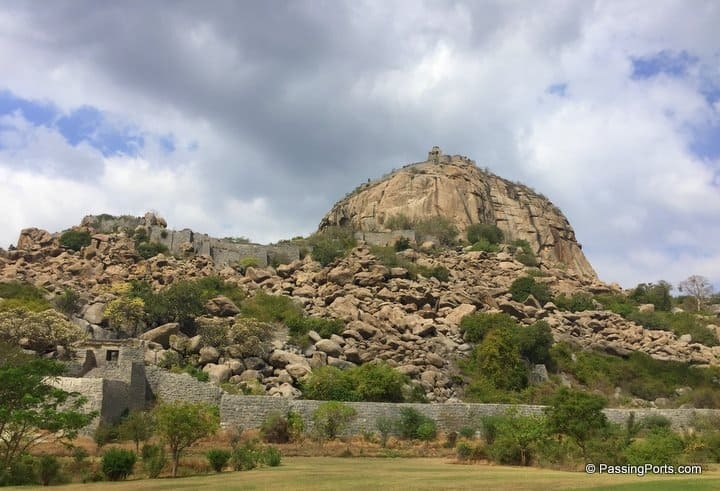 The Gingee Fort comprises of three hillocks – Rajagiri, Krishnagiri and Chandrayandurg. Standing strong even today, do not miss this beauty. I’m sure most of us have at least heard of Auroville. But do you know what Auroville really is, how did it become an independent community and why is it the way it is? This is not just an area, but an entirely different world within the world we live in. The Mother has referred to Auroville as the ‘city the Earth needs’. The logo or the symbol of Auroville is a circle that is divided into five segments. The Matrimandir is like the Sun to this city and is said to be Auroville’s soul. As per the vision of the Mother, this is for Aurovilians who finds their inner peace and contributes to this community and humanity. Their website talks of the journey and is quite an interesting read. One needs to have prior permission to visit inside the Matrimandir. You can stay inside Auroville to have a different experience altogether. Walk the roads of Pondicherry and relive history the old fashioned way. If the ‘Heritage Walk’ is not your cup of tea, or the heat is killing you – don’t worry as they have rickshaws / Cyclos taking you around. Better still, you can enjoy this quaint French town at your own pace by renting cycles. You can either book through the Tourism department and enjoy a guided tour or from the hotels you choose to stay at, most of them rent cycles as well. Imagine cycling along the promenade — absolute bliss! Slowly, more and more people are getting to hear about Scuba Diving in Pondicherry. If you have what it takes to learn this adrenaline rushing adventure, plan your days accordingly to enjoy and do something new in this beach town. Surfing is picking up in Chennai off late, but it first started in Pondicherry. If you’d like to surf, then check this out. As I mentioned earlier, amongst the usual things that most people do in Pondicherry are visiting the Rock Beach, Ashram and Manakular Vinayagar Temple, the Basilica Of The Sacred Heart of Jesus, Eglise de Notre Dame des Anges and Emaculat Church, Boutique shopping, Cafes, Chunnambar Lake and Paradise Beach, Pichavaram Mangrove and Ousteri Lake.